Thrombosis is a lifetime loss of blood dense masses (thrombus)anchored on the inner wall of the vessel or heart and in greater or lesser degree, impede the flow of the blood. The clot is composed of red blood cells, white blood cells, blood platelets (thrombocytes), and fibrin in different proportions. There are thrombi coagulation, based education which are routine coagulation of the blood (see blood Clotting, and blood clots agglutination (precipitation), which are formed from blood platelets in settling and pasting them on the inner surface of the vessel with subsequent disintegration. On the original agglutination the clot can feel coagulation. Depending on the composition there are thrombi: red, white and mixed (layered). Red blood clot usually coagulation, consists of fibrinous grid that contains the formed elements of the blood, the white of fibrin, platelets, leukocytes. Often the initial part of a blood clot (his head) represented only by platelets and white, and the subsequent part propagating along the axis of the vessel,red. Thrombotic masses - dry, often crumbling, connected with the inner surface of the vessel; they differ from easy otvlekayasj juicy post-mortem blood clots. Clots may form in all departments of the cardiovascular system: the cavities of the heart, arteries, veins, and capillaries. At heart they are formed mostly in ventricular aneurysms after heart attacks, in Atria - with valvular heart diseases. In the aorta and the arteries - in ulcerative atherosclerosis, aneurysm of aorta. In the veins - varicose, long-term stagnation. Thrombosis occur in many diseases as complicating it was studied the process, sometimes thrombosis is the basis of the disease and accounts for particular nosological form - embolic disease (see). Causes of thrombosis varied, however, requires three conditions: the damage to the vascular wall, disruption of blood flow, in particular its slowing down and changing the composition of the blood (violation of coagulation and others), resulting in the loss of dense masses. With the rapid flow of blood clots are formed even at significant damage to the walls of the vessel; promote the formation of thrombosis turbulence of the flow (e.g. in aneurysms) and other barriers to the flow of the blood. There are thrombi wall, which occupy only part of the lumen of the vessel, and abdulrosa filling the lumen of the whole. The outcome of a blood clot different, the most favourable aseptic melting clot proteoliticakimi enzymes, allowing to restore the patency of the vessel; another outcome - the organization of thrombus with its germination and dense connective tissue fixation on the inner surface of the vessel. In the future, in such a blood clot formed channels lined with endothelial tissue, and it turns into the spongy tissue through which can recover the bloodstream (Sewerage thrombus). Unfavorable outcome is a separation of thrombotic masses with subsequent embolism (see) or purulent fusion clot when hit pyogenic bacteria with the development of septicopyemia (see Sepsis). Blood clots in the large veins of the pelvis, the lower limbs), and blood clots right atrium (for example, when the mitral valvular diseases) dangerous because of the risk of pulmonary embolism; blood clots from the left atrium are the source of embolism vessels of the brain, kidneys, intestines, lower extremities. The clinical picture of large venous thrombosis trunks, for example veins of the extremities, pelvis and inferior Vena cava, depends on the location of a blood clot, the degree of concomitant spasm of the vessels, the presence of inflammation, and so on (see Thrombophlebitis). Fig. 1. Wall clot aorta. Fig. 2. Mixed continued thrombus aortic: 1 - the head of a blood clot; 2 - body clot; 3 - the tail of a blood clot. Fig. 3. Parietal white thrombus: 1 - leukocytes and mass sleepsense records; 2 - strands of fibrin; 3 - vessel wall. Fig. 4. 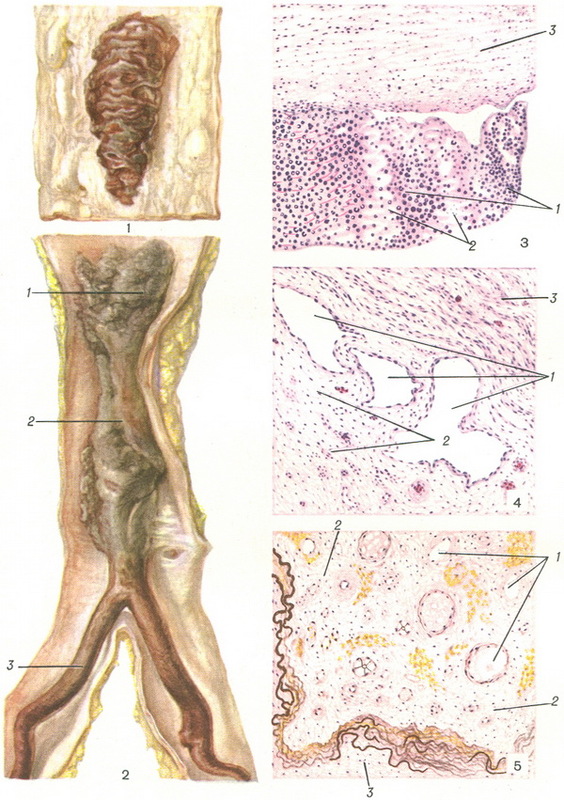 Organization with sewage thrombus: 1 - channels lined with endothelial tissue; 2 - organized thrombotic masses; 3 - vessel wall. Fig. 5. Organization with vascularization of a blood clot (colour on the elastic fibers): 1 - the newly formed vessels; 2 - organized thrombotic masses; 3 - vessel wall.